Explore one of the largest and the most beautiful caves on Halong Bay. Nothing is more enjoyable than exploring the natural beauty of many Islets. Moreover, you will also have a chance to join our Cooking class to challenge your skills in preparing a very famous Vietnamese dish - Spring roll. Our mini van will come to pick you up at your hotel in Hanoi centre around 8.30am. Drive to Halong City. Enjoy the landscape of the Red River Delta country side. Welcome drink - receive cruise briefing, safety instructions and check in. Start cruising and explore Halong Bay - one of the New Seven Wonders of Nature. Visiting Tung Sau area, is covered by the leaping rocks, cultured pearl fishery. 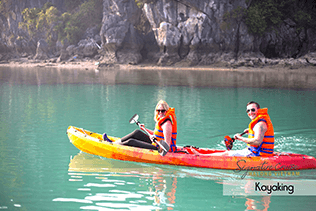 You can wit yourself the process of the jewel, from culturing to harvesting and sculpting, Moreover, you have a chance to do kayaking based on your preference. Enjoy busy space with pearl maker, you can experience the completion of pearl. Visiting the beautiful Ti Top beach for swimming (if the weather permits), Ti Top Beach is especially famous for its fresh atmosphere, clean water, and smooth white sand that create a great ambiance for tourists to relax or passengers can take steps to reach on the top of Ti Top beach to have a whole panorama view of Halong Bay. Back to the boat and free time while sailing to Luon Bo area, and anchor overnight. Attend the Cooking class on sundeck – How to make Vietnamese spring rolls - traditional Vietnamese food. Then enjoy Happy Hour (Buy one drink-get one free). It is time for chit chat and relaxing. Watch the magnificent sunset over Halong Bay. 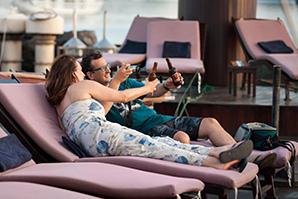 Evening activities include: Leisure time to enjoy a chat around the bar, watching movies and many sort of Vietnam cultural films, relaxing and spending a romantic night on Pelican Halong Cruise’s music, playing cards, chess are available, reading magazines in room and dining room. You may also try your luck at squid fishing & fishing from the boat..
End of Program for Day One. Transfer to day boat for visiting Cua Van village, a small community with around 700 residents living in the root of Ngoc Mountain. Visit Cua Van village by a rustic – row boat, meet the local people who will help you row the boat for sightseeing. Enjoy quiet space and fresh air, you will feel truly relaxing. Visiting Me Cung Cave, which is also known as Maze Cave. Lying in the absolute protection of the World Natural Heritage – Halong Bay, Me Cung has the complex structure, including many compartments and a corridor of around 100m. According to archaeologists, Me Cung Cave belongs to preliminary Halong culture, about 7,000 – 10,000 years ago. The cave entrance looks like a house roof carving deep into the slopes of the island. Walking into the inside, visitors may get the feelings as if they are entering in a great palace of a Persian King. In combination with the light shining from the outer, sparkling stalactites in diverse shapes and sizes drooping like multi-colored curtains make Me Cung Cave shimmering and fanciful like in paradise. In addition, the blue waters of Me Cung Lake inside the cave create picturesque beauty of nature. Set menu lunch served on day boat. Back to Pelican Halong Cruise. Free time on boat for relaxing. Attend the Cooking class on sundeck. Enjoy Happy Hour (Buy one drink-get one free). Watch the magnificent sunset over Halong Bay. Deluxe Vietnamese Dinner will be served. Evening activities include: Leisure time for chatting around the bar, watching many sorts of Vietnam cultural films. Relaxing and spending a romantic night on Pelican Halong Cruise’s music. Reading magazines in room and dining room. You may also try your luck with squid fishing on the boat. The day starts early onboard with Tai Chi session on the sundeck. Tai chi, also called Tai chi chuan, combines deep breathing and relaxation with slow and gentle movements. Back to Pelican Halong Cruise. Check out and settle your bill at reception. Have a buffet brunch while cruising back to the Tuan Chau Wharf. Relaxing on the sundeck or in the dining room enjoying the bay scenery while approaching the wharf. Disembark to Tuan Chau Wharf. Say goodbye to the crew. Stop over the middle to visit a traditional workshop and refreshment about 30 minutes. LET US DESIGN YOUR UNFORGETTABLE TRIP! passionate personnel will assist you in order to design a tailored trip that you will remember forever.